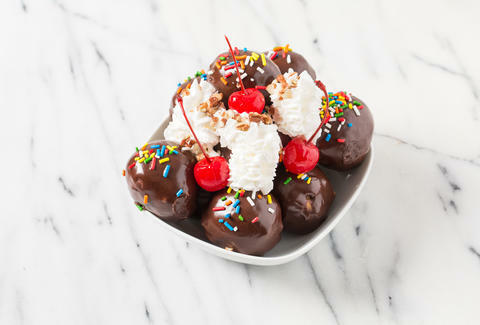 Banana splits are the quintessential American treat -- that messy boat of ice cream, bananas, chocolate, sprinkles, and whipped cream with the cherry on top just screams glorious, glorious self-indulgence. But who has the time/stamina/lack of self-respect to tackle one of those cartoonishly large desserts anymore? 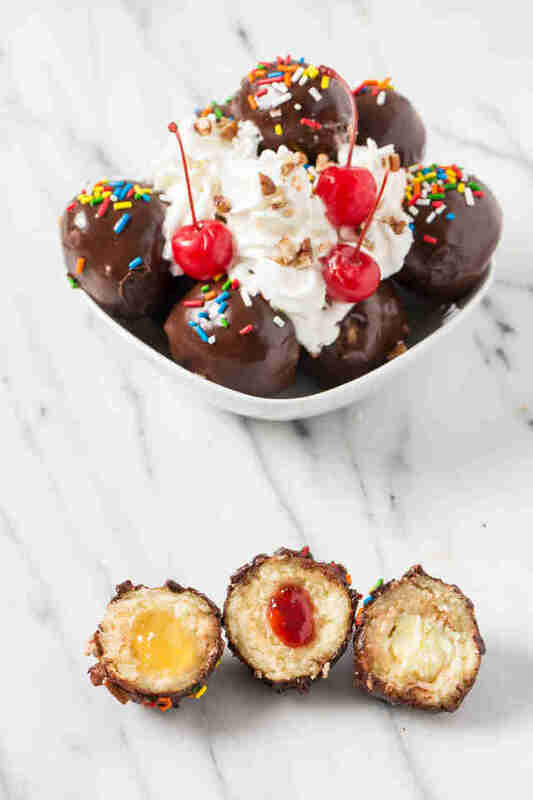 Enter banana-split donut bites -- they're everything you want without the excess. In a medium bowl, whisk together powdered sugar and cocoa powder. Slowly stir in milk and vanilla until the mixture is smooth. Cover the glaze with plastic wrap; set aside. Put strawberry jelly in one Ziploc bag, pineapple jelly in another, and banana cream in another; set aside. Heat oil to 350ºF in a deep fryer or heavy-bottomed pot attached with an oil thermometer. In a small bowl, whisk together the milk and the egg. In a medium bowl, whisk together flour, sugar, baking powder, and salt. Stir the wet ingredients into the dry ingredients, then stir in the melted butter, mixing until combined. Drop 1-tablespoon scoops of dough into the hot oil, without overcrowding. Fry, flipping occasionally, until golden brown, about 2 minutes. Using a slotted spoon, transfer dough to a wire rack on a baking sheet to drain and cool. Tip: dunk the tablespoon quickly in the hot oil before scooping the dough and it’ll slide right out. Snip a tiny corner off the strawberry jelly bag and fit it with a small round pastry tip. Pipe jelly into 8 dough balls. Remove tip, rinse it off, and do the same with the pineapple jelly. Repeat with the banana cream. 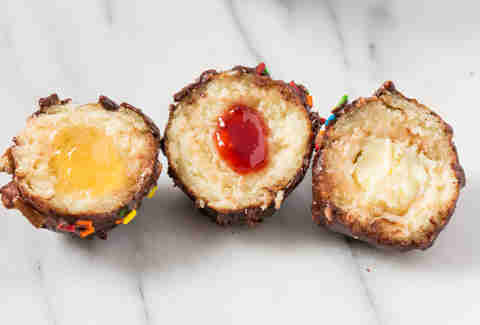 Dip the dough balls, one at a time, into the chocolate glaze and put back on the wire rack. Top with rainbow sprinkles. Serve immediately, topped with whipped cream, nuts, and cherries. Perry Santanachote is Thrillist's former Recipes editor. Follow her @perrysant.